The Design & Fabrication of all type of dies are done through exporting the 3D Model into our Die machining centre. The crankshafts are forged in our 16000 T hammer / 4000 T Press as per requirement & customer specification. The crankshafts undergo a heat treatment process (H & T) & 100% Crack testing (Magnaflux) before we initiate machining of the same. The material composition & properties are perfectly checked prior to machining in our R&D Laboratory & testing centre. Initially Facing & Centering, Turning & Milling & Oil Hole Drilling is carried out on the CNC Machines in the Rough Machining Unit. The Finish Machining Unit consists of CNC grinding, dynamic balancing, post grinding operations, superfinishing & Accessory Product and Assembly. The R&D Laboratory & Testing Centre consisting of metallurgical testing, Crack Testing, Fatigue/durability testing, Dimensional testing, etc ensures that every crankshaft leaving our shop floor is 100% quality checked. 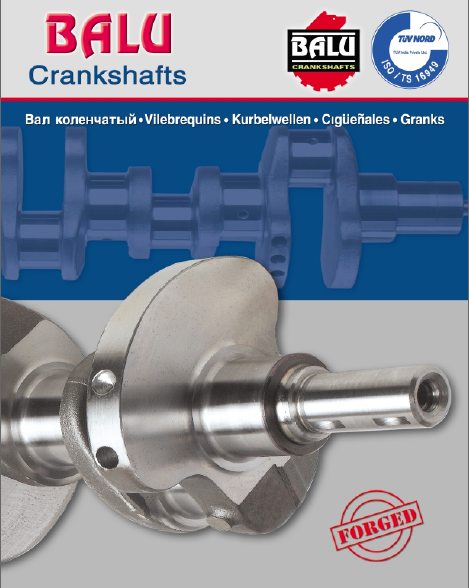 Crankshafts of any applications can be made according to drawing or sample. Through these customer specifications we receive the relevant data required for development. The crankshaft drawings & specifications are developed in our CAD or 3D software. 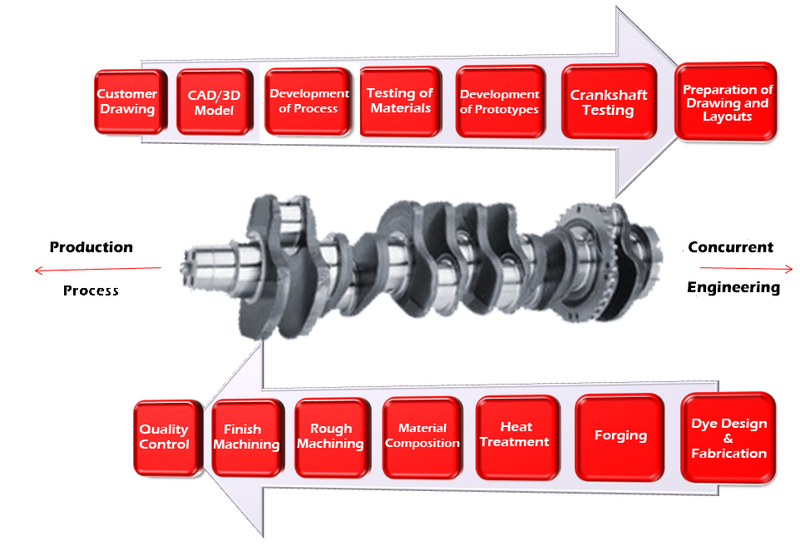 The company has gained expertise in manufacturing of crankshafts for more than 25 years in respect to process of material selection, heat treatment, surface treatment,etc. Material testing is done in our R&D & Metallurgical laboratory. The Use of materials is decided depending upon the chemical composition as per engine running type or if specified in Customer drawing. We have a prototype division where entire process of manufacturing is done on a parallel & flexible line without affecting the series of production. a) Forging: The crankshafts are forged in our 16000 T hammers & up to a length of 2.5 metres. The crankshafts undergo a heat treatment process (H & T) & 100% Crack testing (Magnaflux) before we initiate machining of the same. b) Machining: All machining such as Turning, drilling, milling, threading, etc are done on our automated CNC machines.